Do you want to make an impression with your stickers or labels? In this article, we’re going through the best ways to make an impact with round stickers. At Avery WePrint, round stickers are available in a range of sizes and all materials, so it’s easy to find the perfect match for your needs. If you want to get started on making round stickers straightaway, please go to our round labels page. If you need a labelled circle on the lid of a jar or the top of a container, round stickers may be the obvious choice. 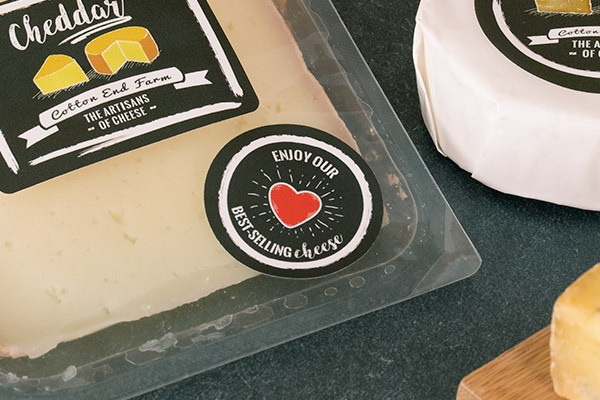 But choosing circle stickers for other purposes is an easy way to make your labelling more distinctive and memorable. Circles play a big role in marketing and packaging design. According to psychologists, people react positively to circles because they represent togetherness and love. While circles may be seen as feminine in nature, they can really grab attention when used with bright colours. To create a perfect circle, the edge, or circumference, is exactly the same distance from the centre at any point. This makes the circle a very special and unique shape. It’s no wonder that the circle has been sacred to many cultures over thousands of years. It has symbolised infinity, as the one line of a circle has no end or beginning. And it has given us one of the best inventions ever – the wheel! Round stickers work well for a wide range of product information, marketing, branding and retail purposes. At Avery WePrint, we’ve seen lots of great examples of customised round stickers being used to attract attention, brand a product and give item information. The round shape is ideal for adding an intense burst of colour. No wonder small round stickers are so effective for bringing attention to sales items, discounts and special prices. 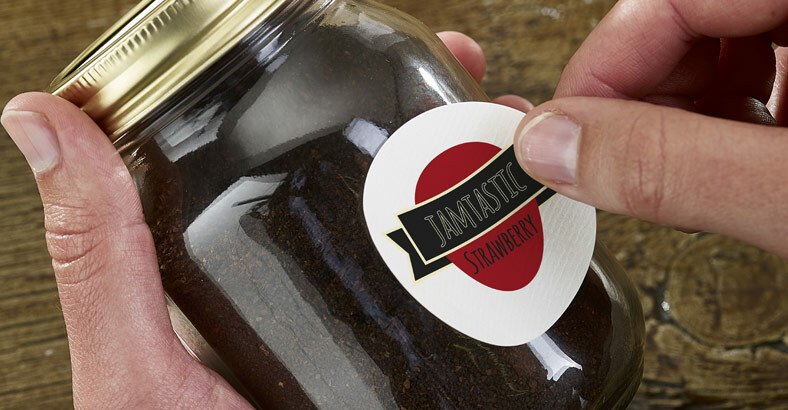 Larger round stickers can add an element of sophistication to your packaging and containers, when used for product information and branding on the front and back of jars, bottles and other containers. You might want to place your stickers directly onto items such as candles or pottery, especially if minimising packaging is important to you. Labels made from our paper material are also suitable for direct contact with non-fatty food. When it comes to using small plastic or paper bags for food, jewellery or craft items, many people fold over the opening and use customised round labels to keep the fold in place and also give the product name and other information. In fact, round stickers are an easy and eye-catching way to get your branding on all kinds of bags, boxes and packaging. Small customised round labels also make ideal envelope seals. And if you’re using a box as packaging, small round stickers are perfect for holding the lid in place and creating a security seal. Are you selling clothes in a store or online? Are you making handicrafts for gifts? Wrapping items in tissue paper always adds a premium touch. And you can take this to another level by using a small, personalised round sticker to hold the tissue paper in place. To make your stickers pop, start thinking about colours – the brighter the better! Psychologically, we’re all pre-programmed to react to red, the colour of fire, blood and danger. This makes red an ideal colour for grabbing attention. Don’t forget that text will only stand out on a red background if it’s white or yellow. If you’re going for maximum visibility for your round stickers, yellow is the most visible colour from a distance. It represents happiness and positivity, and creates a good contrast for dark text. Want to get text around the edge of a round label? Normally you’d need expensive software to do this, but it’s easy with the Avery WePrint online design tool. Once you’ve chosen your sticker shape and size and clicked on the green ‘Start designing’ button, you’ll have the option to start a blank template, use a pre-made template or upload finished artwork for your stickers as a PDF. Using either of the template options, simply click on the option to ‘add curved text’. You can type right around the circle and alter the size of the curve and the size of the text. Whether you’re packaging gifts for friends and family or products for sale, round stickers with a short message can make all the difference. A few simple words can let people know what your gift or product is all about. Popular messages such as ‘Handmade for you’ or ‘Handmade with love’ say it all. ‘Home-grown’ is another favourite, along with ‘From our home to yours’. For ecommerce fulfilment a simple ‘Thank you’ works wonders. A simple word, like ‘Hello’ on a sticker on the packaging makes a great impression. For an extra personal touch you can add handwriting to Brown Kraft Paper labels and Paper labels with a natural or matt finish. At Avery WePrint we offer a choice of six different label materials so that you can find the ideal stickers for your product. White Paper stickers are versatile, durable and suitable for direct contact with non-fatty foods. The three finishes are natural, matt and gloss. White Plastic stickers made from durable white film, give a smooth, sleek look and are also water resistant. Textured Paper stickers are ideal for bottles and jars. They also have water resistant properties and are perfect if you want a vintage, off-white look. Brown Kraft Paper stickers are made from recycled material and give a homemade, rustic feel. Clear stickers also have water resistant properties. We use a special under-printing technique to make colours stand out. Waterproof stickers meet international standards for being submerged in water and exposed to chemicals and extreme temperatures. © 2019 CCL Industries. All Rights Reserved.